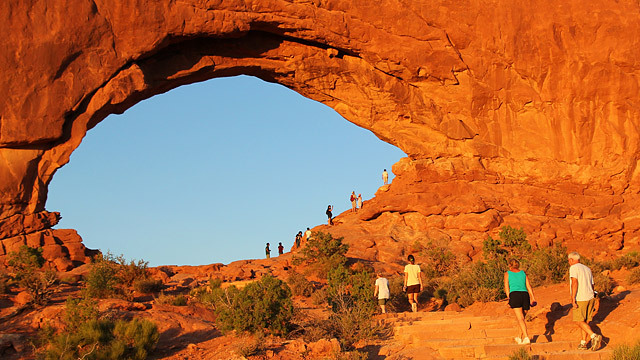 Welcome to the Arches National Park Information Guide. Here you will find all you need to know about the natural history of the park. Learn about the geology, trees, mammals, birds, or other plants and wildlife of the area. The closest major airport is Salt Lake City, Utah. 1. Take I-15 South to I-70 East. Then take State Road 191 South (about 20 miles east of Green River, Utah) to Arches National Park. The approximate distance from Salt Lake City to Arches (Moab) is 235 miles. 2. Take I-15 South to highway 89 South to I-70 East. Then take State Road 191 South (about 20 miles east of Green River, Utah) to Arches National Park. Take I-70 West to State Road 191 South (about 22 miles west of Cisco, Utah) to Arches National Park. 1. Take I-15 North to I-70 East. Then take State Road 191 South (about 20 miles east of Green River, Utah) to Arches National Park. 2. Take state road 191 North to Moab, Utah and on to Arches National Park. 1. Take I-80 East to I-215 South to I-15 South to I-70 East. Then take State Road 191 South (about 20 miles east of Green River, Utah) to Arches National Park. 2. Take State Roads 6/50 or 21 or 56 East to I-15 and then to I-70 East. Then take State Road 191 South (about 20 miles east of Green River, Utah) to Arches National Park. In 1929, President Herbert C. Hoover set aside Arches as a National Monument. Arches remained a National Monument until September 1969, when President Richard M. Nixon signed a bill making it a National Park. In the early 1920’s Alexander Ringhoffer, a prospector in southeastern Utah, traveled through the Klondike Bluffs on the Western edge of Salt Valley. He thought such wonders should be seen by many and suggested that representatives of the Denver and Rio Grande Western Railroad visit the area. The railroad men, particularly Frank Wadleigh, the D&RGW’s passenger traffic manager, were so impressed that they contacted Stephen T. Mather, the first director of the National Park Service. Mather was intrigued and pushed for the creation of a national monument. Finally in 1929, President Herbert C. Hoover set aside Arches as a National Monument. Through the years the monument’s size was modified by succeeding presidents: enlarged by Franklin Roosevelt, diminished a bit by Dwight Eisenhower, then doubled by Lyndon Johnson. At last, President Richard Nixon signed into law in 1971, an act establishing Arches as a national park. Arches contains one of the largest concentrations of natural sandstone arches in the world. The arches and numerous other extraordinary geologic features, such as spires, pinnacles, pedestals and balanced rocks, are highlighted in striking foreground and background views created by contrasting colors, landforms and textures. With the addition of the Lost Spring Canyon area, the park is 76,519 acres in size. Arches National Park is open year round. The majority of park visitors come March through October, with lowest visitation in December and January. You can enjoy sightseeing by personal car, hiking, biking (established roads only), picnicking (3 designated picnic areas in park), and camping. Native Americans utilized the area for thousands of years. Archaic people, and later ancestral Puebloan, Fremont and Utes searched the arid desert for game animals, wild plant foods and stone for tools and weapons. They also left evidence of their passing on a few pictograph and petroglyph panels. The first white explorers came looking for wealth in the form of minerals. Ranchers found wealth in the grasses for their cattle and sheep. John Wesley Wolfe, a disabled Civil War veteran, and his son, Fred, settled here in the late 1800s. A weathered log cabin, root cellar and a corral remain as evidence of the primitive ranch they operated for more than 20 years. A visit to Wolfe Ranch is a walk into the past. Paleo-Indians lived in the lush canyons leading to the Green and Colorado rivers from about 10,000 to 7,800 BC and might have been the earliest people to see Arches. Although there is no evidence of Paleo-Indian use in the park, their spear points and camps have been found nearby. By 9,000 years ago, the climate here became too warm and dry for many large mammals. They and some of their Paleo-Indian hunters moved to higher habitats. Those who stayed in the canyon country depended more on gathering and traveling. This lifestyle, called Archaic, meant that the people had to live in small groups and travel extensively. Archaeologists have found a few spear points, occasional campsites, and quarries for stone needed to make tools. Barrier Canyon style rock art panels, once attributed to the more recent Fremont culture, are the best evidence of the Archaic hunter-gathers in Arches. Pinyon and gnarled juniper trees add a splash of green contrast to the red sandstone terrain. When conditions are just right, wildflowers bloom in profusion from April to July. Most species of mammals are nocturnal, but you might see mule deer, kit fox, or more often, jackrabbits and cottontails, kangaroo rats and other rodents, and small reptiles. Flocks of blue pinyon jays chatter in tree tops; migratory species such as mountain bluebirds and residents such as golden eagles are seen by careful observers. Visitors with mobility impairments can access the visitor center, restrooms throughout the park, Devils Garden Campground site #37, the Park Avenue Viewpoint and the Delicate Arch Viewpoint. For visitors with hearing impairments, a variety of publications may be obtained at the Visitor Center. Wayside exhibits with illustrations and text on natural and cultural features are situated throughout the Park and in the Vistitor Center. Park Information is also available by TDD phone at: 435-719-2319. The basic road tour with stops at overlooks requires several hours to a half day. Allow more time if you plan to hike or otherwise experience the park. Bicycles are welcome on roads in the park. There are no designated bike trails. All bicycles must abide by vehicle regulations and are not allowed on any hiking trails or off established roads. The Devils Garden Campground, located 18 miles from the park entrance, has 52 tent and trailer sites, plus two walk-in group sites limited to tenting for ten or more persons. Facilities include flush toilets and water until frost. Camping reservation may be made and you can pre-register for individual campsites at the Arches Visitor Center between 7:30 and 8:00 am, or at the Entrance Atation after 8:00 am. Group campsite reservations are available for the two group sites. The campground fills daily mid-March through October, often by early to mid-morning. Technical climbing is allowed but is only for experienced climbers. Climbing is not permitted on any arches named on the USGS topographic map, on Balanced Rock and a few other locations. No food is available in the park. In the Arches Visitor Center, you may buy film, water containers or chilled bottled water, as well as informational materials. Bring your own food or there are restaurants in the local communities. Hiking trails of varying length and difficulty lead to and through arches and into the heart of the park. Park lodging is limited to one campground. Devils Garden Campgrounds takes reservations. There are local campgrounds and lodging in the nearby communities. The Devils Garden Campground, located l8 miles from the park entrance, has 52 tent and trailer sites, plus two walk-in group sites limited to tenting for ten or more persons. Facilities include flush toilets and water until frost. Camping fee is $ 10.00 per night for individual sites in summer; $ 5.00 when water is off (November through mid-March). You must pre-register for individual campsites at the Arches Visitor Center between 7:30 and 8:00 am, or at the entrance station after 8:00 am. Group campsite reservations are available. The Arches campground fills daily mid-March through October, often by early to mid-morning. Rangers lead walks into the Fiery Furnace twice each day. The cost is $ 8.00 for adults; $ 4.00 for children 6 to 12 years old and Golden Age Pass holders. Group size is limited, and walks often fill a day or two in advance. Reservations can be made in person at the visitor center up to seven days in advance. Pets are allowed only on park road, in parking lots, or in your campsite. They must be physically restrained at all times in these locations. Pets are not allowed on or off trails, in the backcountry, or in buildings. Pets left unattended in vehicles during the heat of the day can die from heat exhaustion. Located: Just inside the Park Entrance. Hours: 8:00 am to 4:30 pm – Daily – November through March. Closed December 25. Extended Hours – April through September. In summer, June through September, temperatures may exceed 100 F and in winter, December through February, temperatures often drop below 32 F. Temperatures may range 50 F in a 24-hour period. Dress accordingly. Very dry! Carry drinking water at all times.